I would like to take a moment to rejoice. Rejoice to enjoying a soft serve frozen treat with fruit and no dairy. No more lactaid folks!! 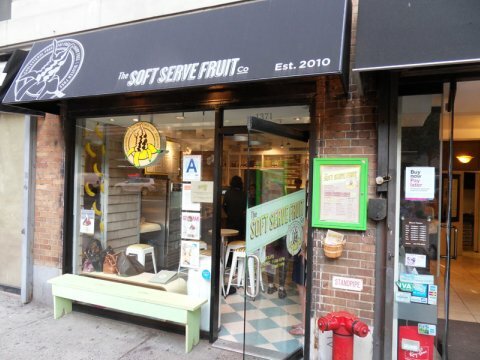 (well for this treat) Soft Serve Fruit Co. has four flavors, Banana, Apple, Pumpkin and Strawberry. Each is packed full of fruit because it actually is fruit. The ingredients are fruit, water and sugar... oh and love. They take the fruit, puree it and blend in the water and sugar. Once frozen it's served like soft serve ice cream. If you are watching what you eat they have nutrition facts in the store. YAY! The new and improved Choux Factory on 87th St and 1st Ave is open again. HORRAY for the best cream puffs in all of Manhattan! That's right the Best Cream Puffs in all of Manhattan. Some people go for the banana pudding, most go for the cupcakes. What is the best thing about Vegan Divas? You can get them at multiple locations. If you've never had vegan desserts, you should give them a try. You may find you like them, especially if you have food allergies and are lactose intolerant. Check out their site for locations nearest to you. This is a great place when you are on the go and need something quick and something sweet. Corrado's has multiple locations on the UES. Sure this might be a gourmet grocery store and sure it maybe out of your way, but inside is a hidden treasure. A jam filled, power sugar dusted treasure. The treasure comes in two sizes, I recommend the small for less guilt if you are a guilt stricken person when you eat desserts. Their powdered jelly doughnuts are scrumptious. These aren't your chain store doughnuts, they're the real deal! Grab an extra one, because you will eat one as soon as you exit the store. If you are on the UES you must pay a visit to this institution. The original location is in Gramercy, but this location will suffice. Who would have thought a bagel shop on the UES would have some crazy good muffins? Well Bagel Works does for sure. Try the Blueberry Crumb. It's okay to eat it with a fork.